We own honey bees. We didn’t invite them. They just showed up one day with suitcases and moved into a tree. We have an agreement. They stick to their area and we stick to ours. They pollinate and fertilize and we enjoy the flowers and fruit. “I think they know me,” my husband said recently. “Really? How do you know?” I asked. “They’ve never stung me,” he said. Knowing about the worldwide shortage of bees has made me appreciate our honey bees all the more. Sometimes I think I should rent them out to distraught farmers in Lodi. Or ship them to Spain for the growing season. But I haven’t done any of that. I just continue to observe them in their tree. Lately however, my husband thinks there’s something wrong. They’re spilling out and clustering by the hive entrance. “I think there’s some overcrowding going on,” he said. 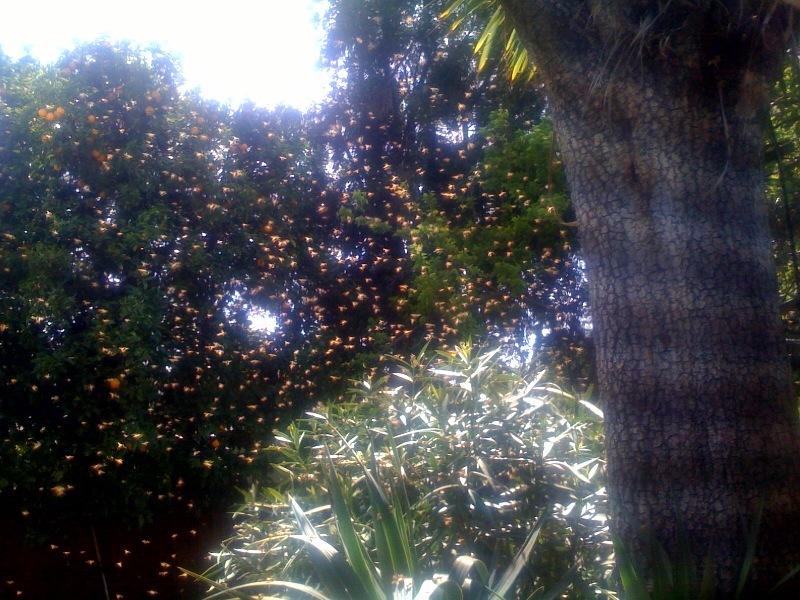 The bees looked like a copper beard on the tree. “Maybe they’re hot and this is their summer place,” I said. We worry about them, but being outside their hive doesn’t seem to be bothering them at all. I read a few bee-keeping blogs. One in particular caught my attention. “See? They’re sunbathing on the terrace,” I said to my husband. “Wow. Who gave the order, I wonder?” he said.